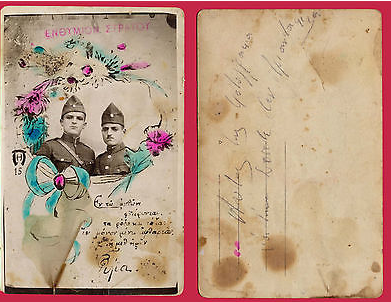 I saw this photograph card available on Ebay, labelled "Greece 1920. Greek Soldiers Photo"
Interesting military caps - can anyone identify what branch of service they are in? You can follow the link above and move your mouse over the photo to enlarge for a close up viewing. Can someone read the inscription and address - maybe we can forward this photo to someone in the family.